I went to see An Unruly History at the Jewish Museum over the summer. This was my most inspiring piece. A Saturday ago, I went to the Jewish Museum to see The Snowy Day exhibit. 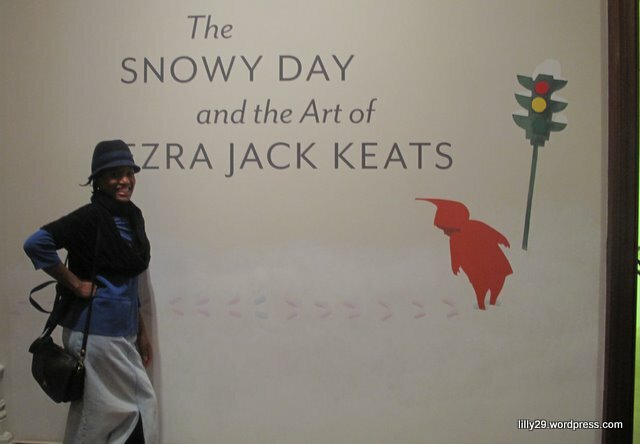 Prior to my visit, I had very little knowledge of Ezra Jack Keats. I only remembered reading The Snowy Day as a child. It wasn’t even a favorite book of mine. I don’t know why I felt I really needed to go see the exhibit. Anyway, I went and was glad I did. I went with preconceived ideas about the book and it’s illustrator/ author. I thought Ezra Jack Keats was black and was surprised to learn that he was Jewish. I was also surprised when I learned that his book was the first children’s book to include a black protagonist. He knew what it felt like to be ignored because of something about yourself you can’t change and did not only use Black characters but Hispanic and White. “My book would have him there simply because he should have been there all along” he said in response to Pete’s character. As I walked through the exhibit, I felt so inspired. The art in itself was amazing. He started drawing as a child and even though he did not have that great of a relationship with his mom, she encouraged him to draw.